Take A Break From Your Over-stressed Life And Gift Yourself A 4-Day Dare Greatly Experience. Leave it all behind to breath and relax in the awe inspiring scenery of the Austrian Alps. When you feel constantly rushed and stressed out …. When you feel trapped – caged – with no escape …. When you feel pushed and shoved in every direction …. When you’re frustrated with your lack of focus …. When work is getting in the way of everything else …. Sign up to schedule a talk with Gerdi and find out! A Dare Greatly Experience …. Is a bespoke experience with coaching customised to meet your needs and expectations. That’s why we have a call before you book to make sure this is the right experience for you. Is one-on-one. A more intense focus to achieve BIG results in the days we spend together. A one-on-one also makes it more personal and therefore easier to share and be open. Is perfect when you are a more private person, aren’t looking for a group experience or just want to reap the benefits of an intense, focussed coaching experience. Allows for plenty of quiet time. Time to digest, reflect on and integrate your insights while relaxing in your hotel or walking through a winter wonderland among snow covered mountains. Offers release from mental stress through physical activity as you move through one of Europe’s most beautiful mountain ranges. By Immersing Yourself In An Experience Like This You Give Yourself The Gift Of Breathing Freely And Releasing Your Spirit! When you come back you’ll somehow feel rejuvenated, energised. And maybe, just maybe, all you’ll be able to think about is when you can get back there. Because in the mountains you can hear yourself, feel yourself, come back to yourself and connect with the beauty, serenity and freedom that they hold. They offer the ultimate escape from the stress of your life. You need to find space; space to breathe, to relax and take some time out. Mountains breathe with you, holding you in their arms, bringing you back to life, giving you a change of perspective and offering an authentic look at who you are and the challenges you face. Moving in nature, among mountains especially, isn’t just a physical act; it’s an act of ultimate mental stress release. It’s about feeling your body, giving over to instinct, finding your rhythm, your pace. It’s about moving with the mountains, with nature. Thus every run down the mountain is a life lesson. The mountains are a place of great healing and regeneration and 4 days on a Dare Greatly Experience in one of Europe’s most beautiful mountain ranges will leave you feeling like a whole new you. For 4 days you will be immersed in an experience of among the mountains of the Austrian Alps. As you are guided across their slopes you will also be guided back to yourself. Your transformation begins when you leave behind your stressful life and immerse yourself in the powerful energy of the ancient mountains of Nationalpark Hohe Tauern and the Kitzbüheler Alps. Everything else is taken care of, the routes pre-determined, the mountains ancient and full of the wisdom of the ages, your coach and guide, specially trained to guide you into nature and back to yourself. For 4 days you will…. 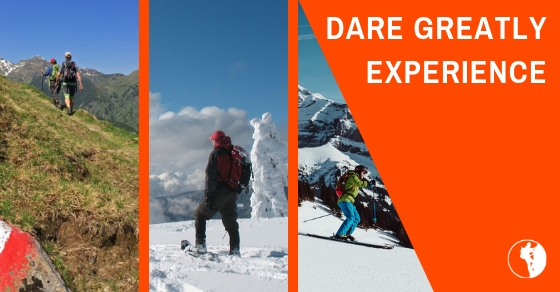 A bespoke Dare Greatly Experience can be created for all level of hikers and skiers – from complete novice to expert. To make sure you enjoy your time spent in the mountains extensive help is provided to prepare you for the experience. Everything from gear advice to physically preparing yourself – we’ve got it covered. I’m a former project manager, consultant and interim manager with 20+ years of experience in the corporate world. After recovering from a serious burnout I left that stressful world and moved to the Austrian Alps. Now I live and work in an environment that is the opposite of one I left behind. A world where mountains and Mother Nature determine the rhythm of life instead of the pressures of career and society. Since moving to the mountains I guide people of all ages and backgrounds, but in particular corporates, entrepreneurs and families away from their over-stressed lives and the disconnection in it and back to themselves by taking them into the mountains where they can truly relax. I have a special talent for taking people on trails – in mountains and in life – they would never think of going on by themselves. I help people reach heights they didn’t think themselves capable of and in doing so help them leave the stress of their lives behind, reconnect with nature, with themselves and their loved ones. My approach is straightforward, pragmatic and result-oriented. I use a blend of proven coaching techniques, NLP and my extensive experience in project management and consultancy, while the mountains provide an easy-going, relaxed environment in which connecting on a safe and deep level occurs almost effortlessly. What are you waiting for? You want to relax and de-stress? You want to feel rejuvenated and more energised? This 4 day experience is for you! You’ll never forget this experience in mountains as beautiful as the Austrian Alps and so many clients come back time and again to experience the thrill and inspiration on offer.